S07xE03 – We begin with what looks like a scene out of a terminator movie, with a western narration. Turns out it’s more of a Cowboys and Aliens sequel. We have a man that looks similar to Borg, with a giant laser gun for an arm tracking down a man with a green tattoo on his face. Borg man (the Gunslinger) tells the guy to make peace with his gods and then terminates him. 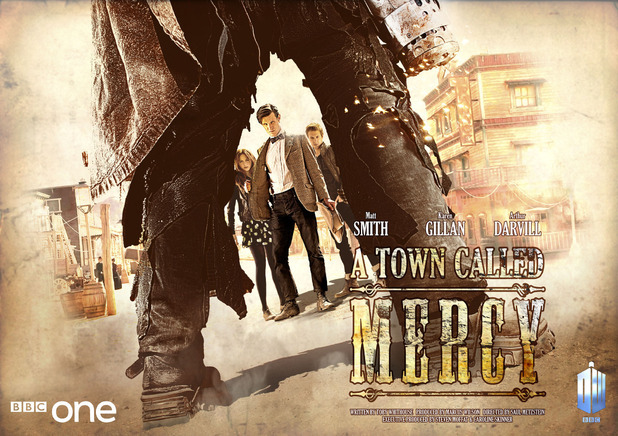 We then see The Doctor, Amy and Rory standing outside a small western town called Mercy with 81 residents. They come across a border made with stones and wood, and a sign that says “keep out” on the edge of the town (when has this ever stopped The Doctor or Amy?). The atmosphere of the town is eerie, and The Doctor notices an electric street light that is ahead of the technology for the time by 10 years. Next you get the typical belly up to the bar scene, where The Doctor in his toughest cowboy impersonation asks for tea and tries to look “cool” with a toothpick in his mouth (yeah it didn’t work). The town residents ask who he is and when he says The Doctor, they all become startled, and then ask if he’s an alien (odd and kind of personal, but ok). He says yes, and they proceed to throw him out of town, literally. We then see the Gunslinger flash in and out getting closer and closer, the Marshal stops this revolt and gets The Doctor back on the town side of the border where the Gunslinger then disappears. Marshal Isaac tells the town he’s not the alien doctor the Gunglinger is looking for and proceeds to explain the situation. We then meet the actual doctor the town is so eager to get rid of, Kahler Jex. We find that the electricity is stemming from Jex’s ship, and that he was also able to cure Cholera. The Doctor asks Jex why he doesn’t just leave, and Jex replies that his ship was very badly damaged. You see a look in The Doctor’s face that implies he knows there’s more to that story, and hatches a plan to get back to the TARDIS to take everyone away from the town. Or so that’s the plan he claims it to be. Rory and Isaac are used as decoys running across the desert for the Gunslinger to be distracted by while The Doctor rides toward the TARDIS. Amy and Jex have a heart to heart where Jex explains that he’s comfrotable in Mercy taking care of the townspeople and has no desire to go back to his home planet (curious). Meanwhile on The Doctor’s journey to the TARDIS, he comes across the electrical conduit stretching from Jex’s ship to the town, and traces the conduit back to the ship. The Doctor tries to open the ship and sounds the ship’s alarm. The alarm is so loud, they can hear it back in Mercy and Jex becomes worried that The Doctor isn’t following the plan he laid out. The Doctor manages to open the ship and view the personal files of Jex. There he learns the truth about Jex (no wonder Jex is worried). Jex knows he’s in trouble and holds Amy at gunpoint. The Doctor officially meets the Gunslinger and explains he knows everything and tells the Gunslinger he deserves justice. The Gunslinger warns The Doctor that he will kill the next person to step over the borderline, so he best make sure it’s Jex. Back in town Jex is “explaining” his actions when The Doctor strides in calling him a liar. The Doctor explains to Isaac and the group that the Gunslinger is a cyborg and that Jex was the one who created him along with others by telling the people they were selected for special training and then fused their bodies with machinery making them weapons for war. After the war, Jex explains that they had all the cyborgs decommissioned, but it seems that one got its circuitry damaged and went offline hunting the team of creators, killing them one by one after they fled their planet crashing on Earth, and now Jex is all that’s left. Amy decides Jex needs to be protected, but The Doctor, Rory and Isaac decide that Jex needs to be given to the Gunslinger for justice, and to save the town. Here Amy becomes the voice of reason, and convinces The Doctor he is wrong and makes him question what has become of him while he’s been travelling alone (about time something’s said!). The Doctor agrees to come up with another plan, but it’s too late, the Gunslinger has arrived. Jex tries to reason with Gunslinger, but it doesn’t work and he goes to terminate Jex, but Isaac gets in the way and gets shot instead. He asks The Doctor with his dying breath to take care of his town, and so The Doctor dons the Marshall badge and does just that (I’m a Marshal now! Marshal’s are cool). The Gunslinger warns The Doctor that he has until noon tomorrow to give up Jex. The Doctor devises a plan to use the townspeople as decoys to distract the Gunslinger while Jex makes a run for it. The plan is working until Jex decides that enough is enough and that it must end. He destroys himself and his ship thus satisfying the Gunslinger’s vendetta. The Gunslinger says he now has no purpose and will self-destruct as he is a creature of war, but The Doctor interjects and tells the Gunslinger he can protect the town and therefore have a purpose. And off they go in the TARDIS. We then get a super sappy episode ending where the western lady narration comes back, a little girl stares at the Gunslinger protecting the town, and with a final shot, the Gunslinger stands proud wearing the Marshal badge (and now I need something salty). Best of the episode: Amy reminding The Doctor of who he is and can be, not who he thinks he has to be. In these three episodes so far, we have watched The Doctor’s morality line grow increasingly more gray. And this time instead of trying to see a way where Jex doesn’t have to be sacrificed to the Gunslinger, he decides to just give him up and end it all with yet another unnecessary death. Leave it to Amy to be the voice of reason, thank God. Worst of the episode: The tiring theatrics that seem to plague the series with Steven Moffatt under the helm. I feel that there is a large disconnect at the heart of the show where Moffatt feels its “Little Engine That Could” persona isn’t good enough. And that’s fine, but while he’s trying to make it a bigger show than it once was, he’s lost the true meaning of the show that makes the fandom so passionate, having your mind blown. Remember the days when the hints were subtle and then it all comes together in one big explosion like Bad Wolf or Harold Saxon? Yeah me too. Those were the days. What the episode ruined for us: So far the idea that Christmas is going to be something to look forward to.